It’s prom season. A quick peek at Facebook shows girls pampering for the big event, doing their hair and makeup before dressing up in fancy gowns. It was a simpler time when I went to prom. We just posed for a few pictures at the event. Now, they seem to have an entire photo shoot before they go to dinner! I’ll do my kids a favor and not show THEIR prom pictures. But mine? Well, these two guys will have to get over it. They probably aren’t reading anyway. 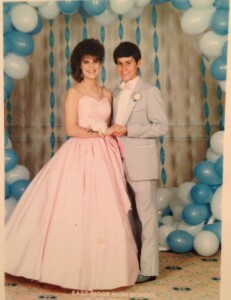 This is Junior year prom. 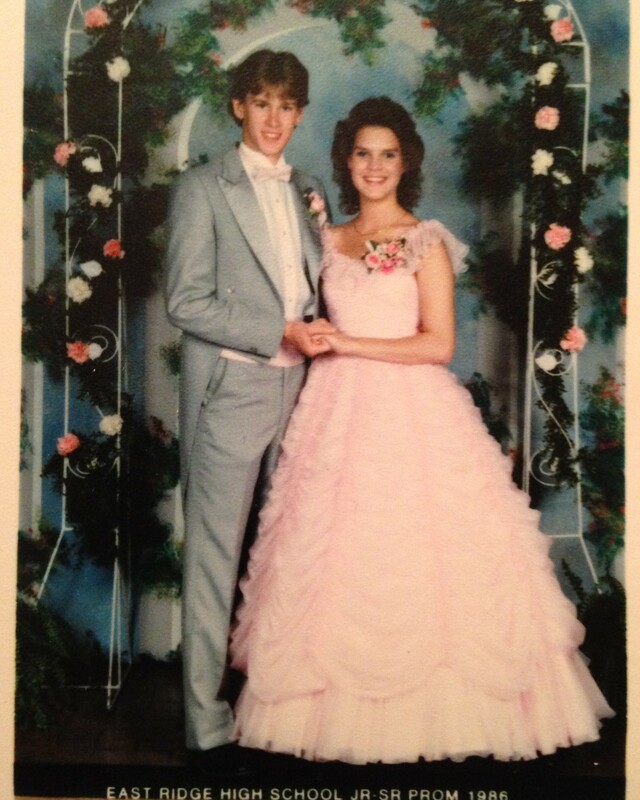 And here’s Senior year prom. Guess I liked pink back then. The second dress, ironically enough, was bought on my one and only trip to Memphis on a college visit to Memphis State. The same trip where I told my mom that if I never saw Memphis again, it would be too soon. God sure has a sense of humor, doesn’t He? But all that thinking about prom made me think about the lie that Satan tells us about having to be pretty. (Or “handsome” for those guys who may be reading and don’t want to feel left out.) The world plays along, buying into and promoting the myth. And our kids are especially under attack. Daily they are under pressure to look the way society tells them to look. And they shouldn’t have to be. I’m reminded of an incident that happened in high school. there will always be someone prettier. I didn’t know what to say. I didn’t know what to think. I just looked at him in disbelief. But once my brain started working again, the questions came fast and furious, chasing each other. Does he not think I’m pretty? Does he like someone else? Is he trying to tell me some hidden message? Does this outfit really make me look hideous? How dare he tell me that there will always be someone prettier than me? He’s my boyfriend! I camped on that last thought for the rest of the evening. I’m sure I wasn’t very good company. We dated for two more years after that, but I never really forgave him for his comment until many years later. I never asked him what he meant by it, either. I just tucked it away in a safe place in my memory where I could easily dust it off and fume over it when I was looking for a reason to feel sorry for myself. Like many teenage girls, I was caught up in my appearance and what other people thought of me. Looks were important to me. I wanted to feel pretty. I wanted to be pretty. I longed to be the most beautiful person in someone’s eyes. I felt like my boyfriend had let me down. In my twisted way of thinking, it was his responsibility to put me on a pedestal and tell me I was the most beautiful girl he knew. I bought into the lie of thinking beauty was the most important thing. Am I pretty? Will anyone ever think me to be beautiful? For years after we broke up, on into college, I would regularly stare in the mirror and wonder if I were pretty enough, good enough, to find my place in the world. I lost weight to look even better, briefly cutting down from a size 8 to a drastic size 2. Let me just say, I should never be THAT skinny. It wasn’t a good look for me. But at the time, I was desperate to be beautiful. I even entered a beauty pageant: the Miss Tennessee USA 1989. 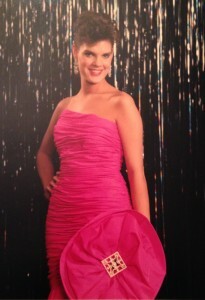 Here’s proof of my insanity, taken at the pageant. I was proud of the giant “flower.” Go ahead and laugh. Sarah did when my mom made her try it on once. Definitely dated. Y’all, let’s face it. I’m not beauty pageant material! And don’t try to tell me otherwise. I’m okay with it. That boyfriend was right. There will always be someone prettier than me. And you know what? I really am okay with that now. I was looking for acceptance based solely on my appearance. God, however, looks not at the outward appearance. He looks at the heart. And all those gals who dressed up this year for prom? Some of them will go to bed after prom thinking that they fell short of beautiful. That they weren’t pretty enough. I pray that they escape the lie sooner than I did. That they realize just how beautiful they are to God. If you know one of those girls, do me a favor. Give them a hug for me. UPDATE: I should probably mention that the former boyfriend and I have since “talked.” His comment way back then was simply meant to encourage me to focus on lasting inner beauty over outer beauty. To his credit, he told me more than once I was pretty. In my teenage angst I just chose to focus on the one time that he didn’t. Next postAccountable? ME? You can help.